Description: Jesus revealed to Sts. Gertrude, Bridget, Mechtilde and Catharine of Sienna that those who meditate on his Passion are very dear to him. 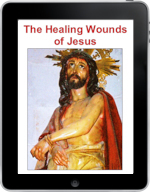 This ebook is a series of descriptions of how Jesus suffered for you, as revealed by saints and mystics through the centuries and by scientists today, leading you through a fuller understanding of Jesus in prison, the scourging, being mocked as king, the road to Calvary, and the crucifixion. The material in this booklet has been compiled to help you find healing through Jesus, to give you a deeper experience of his love, and to inspire you to return that love more fully. It will also inspire in you a greater appreciation of the Catholic Mass and the Holy Eucharist. Ideas for use: Personal meditation, Eucharistic Adoration, outreach to inactive Catholics, hospital visitations, etc. One customer reported to us that she regularly gave it out in her hospital ministry, and one day she encountered a woman who had been an inactive Catholic for many years and was now dying of cancer. This ebook changed the woman’s life, bringing her peace and great joy in her last days, successfully preparing her for a happy reunion with Christ after death. • You may not post anything on the internet in any form except when it is embedded in a parish PDF bulletin. • The copyright footer of documents must be included on all copies. • You may not add to or alter content without requesting and receiving special permission. Authored by Terry Modica, writer of the popular “Good News Reflections“. These printable PDF e-books can be read on your computer, iPad, or smart phone. Spanish versions of all our printable materials may be requested by special order when you don’t see it listed on the order form. There are no hard copies available. The digital download will be printer-ready. You will be able to download them immediately after payment directly from our website. You will also receive an email with a download link. If the resources you download don’t seem to work right, look for the instructions that come with it, or see our Special Instructions page. If that doesn’t solve it, contact us; during office hours we can usually give you attention fast. Our shopping cart allows payment by check in U.S. funds or processes checks and credit cards via secure PayPal, which converts foreign currency. If you live outside the U.S. click here to see if PayPal is available in your country. If you cannot afford to pay the price of a product, or if you live in a country that does not allow payments to the U.S., you may request a charitable donation of the product(s)* you need. Click here to request a Charitable Gift Voucher. 9:00 am – 6:00 pm Eastern US time Monday – Friday, excluding holidays. Copyright © 2019 Catholic Digital Resources. All Rights Reserved.